If you're looking for the best dog beds for labs, we've got a nice little guide for you below. Labs are larger dogs, so they’ll need a bed that can fit all of their needs. Also, labs are generally very active dogs, so they’ll need a bed that can withstand a little abuse. Finding the right bed for your lab can be a particularly daunting process, and it can be frustrating. However, we’re going to give you some tips and tricks to help you through the process, and we’re even going to give you a few recommendations to get you started. Honestly, these beds have to be durable. Labs are incredibly active dogs, and they have a tendency to chew at a young age. It’s important that you get a bed that can take some wear and tear and won’t be completely destroyed after a few months. Labs are large dogs and they grow quickly. I don’t think it is a particularly good idea to get them a bed that fits them when they are a puppy, but there isn’t room to grow. Labs grow quickly, and I’m sure you don’t want to keep buying beds during their growth process. 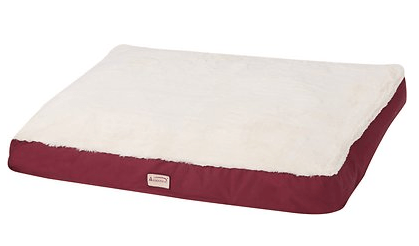 Shoot for a dog bed that is large or extra-large. Depending on your lab, either of those should work. By extra components we mean heating or cooling components. Since labs are active, they have a tendency to get injured or have sore muscles. Just for the sake of keeping your dog happy and comfortable, you may look into orthopedic features in a dog bed. 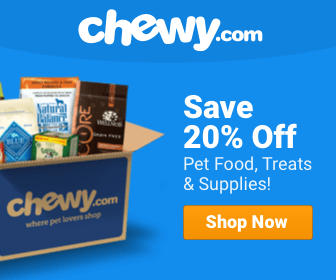 This will help your dog heal and ease sore muscles after a day outside. A lot of us, both dogs and humans, suffer from chemical allergies. 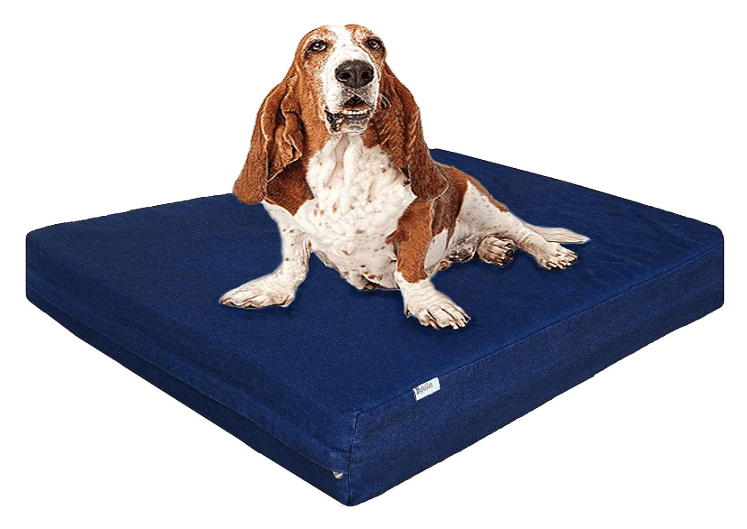 You want to look for dog beds that won’t cause issue for either you or your dog. Look for beds that advertise eco-friendly filling. Like we said, labs are active dogs. They get muddy, dirty, wet, smelly, etc., it’s important to invest in a bed that has a removable cover. This way, if the bed gets dirty, you can just remove the cover and throw it in the washer. Some beds even come with a waterproof, internal liner that will protect the material inside from bacteria, mold, etc. This is definitely something to look into. There are plenty of places online where you can look into a bed to see what owners and their dogs thought of it. This is always important, especially if you’re spending a decent amount of money on it. Definitely look for other people who have labs and used the product. It’s important that you know it will work for your dog. This isn’t for the dog, really, it’s for us. It’s a personal preference of mine. I like the dog bed to go with the rest of the house. This is because I don’t want to have to toss it in a closet when I have company over. It’s my dog’s bed; it should be allowed to be accessible at all times. I don’t sacrifice functionality for looks, but I do want the bed to be aesthetically pleasing. This bed is insanely durable; I truly think the designers had labs in mind when they came up with the concept of this bed. It’s large enough for your lab to lie comfortably. It comes with a thick, heavy-duty denim cover that can be removed and washed. Also it has a waterproof internal zipper cover that will keep the internal foam from getting wet and ruined. It should also be noted that this bed is orthopedic. It comes with a 4” thick, memory foam mattress. 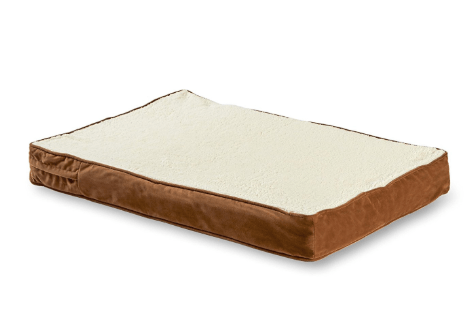 If you don’t have an older dog, it’s optional in my opinion to get the memory foam bed. It’s definitely more of a luxury than anything. However, older dogs usually do need some sort of memory foam mattress to help them age properly. Since this bed is so durable, you could buy it when your lab is young, and it will likely last the duration of their life. This is the top bed we recommend. This is a great bed for an outstanding price. It’s a large bed that will work great for your lab. Also, it’s another orthopedic bed that will be suitable for your lab throughout the duration of their lifetime. 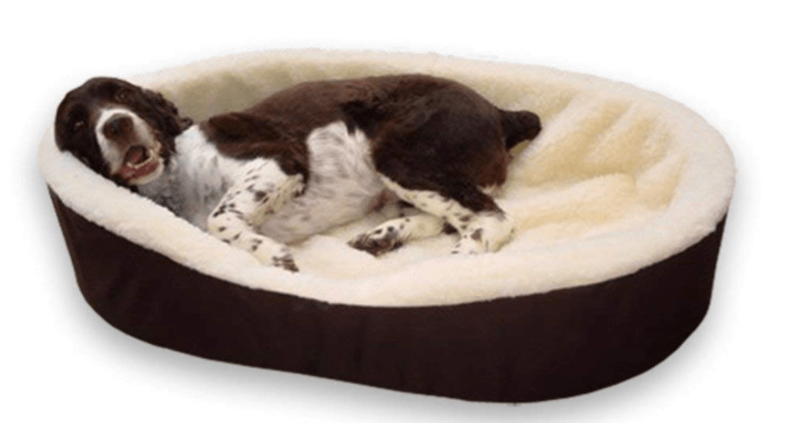 This bed is especially made for senior dogs, but it will work well for any dog that uses it. Also, it can be used as preventative care to help keep your lab’s body healthy through its lifetime. This may help prevent arthritic and other issues that come with age. Unfortunately, this bed doesn’t have a removable cover, so it might be a little tougher to keep clean than other beds we review. However, it’s not impossible. You can also clean the bed with a handheld vacuum and a handheld steam cleaner. This is another great, large bed for your lab. This bed isn’t a memory foam bed like the others, so there is a slight price decrease. Instead, this bed is filled with 100% poly fill. This bed comes with a removable cover for easy washing. Also, canvas is very heavy-duty and waterproof, which should keep the fill from getting ruined. This is a great bed for a decent price. However, this won’t be a bed that will last 10 years, it just won’t. 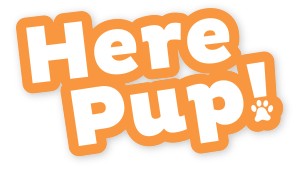 But it’s a great bed to get your dog started, and before they hit senior age. This is a very comfy bed. It’s also a very large bed with a donut design to keep your lab warm and comfortable. You can also remove the cover of the bed for easy washing. The only bad thing I could say about this bed is that it’s made with 2” egg crate, so for a large lab, it may have a tendency to bottom out. Otherwise, we really like a lot of the stuff about this bed, and we recommend it.